That's amazing Lorraine That kitchen looks real, and quite posh.....is there a story behind it do you know? Lovely, Lorraine! Never seen that one before. Can Dusty make me some popcorn, please? My favorite food! This is new to me its for sale on Ebay at the moment. Another fab find Cas. Thanks. Thank you Maggie, that looks better. Cas19 wrote: This is new to me its for sale on Ebay at the moment. Which album is Dusty perusing, is it ECUD ? Thanks Cas. Pictures in CD are different. I thought it must be ECUD by her hair and the photo, plus Madeline. Last edited by IWannaBeABluesSinger on Sun Mar 29, 2015 6:53 pm, edited 1 time in total. Never seen those ones before.. That first one do you know when that was taken? Both new to me Maggie , seen a similar one to the first one like you have, but the other is completely new, any info on that one please? Yes nice ones Maggie thanks.. Thanks Maggie, both new to me and if you have any info on either that would be good. I also have a similar one to the first one but not the second. I think they look like they were taken after her TV shows. Nope - no info. The first one matches a picture obviously taken at a studio but I think the second one is possibly outside because of the coat she's wearing. I think they are all fan photos. Maggie-They are just wonderful. Such a thrill seeing new photos. Thank you. Three new but similar ones to me available from Getty images. sorry they are so big I haven't time to edit them. Gorgeous Cas, thank you so much. 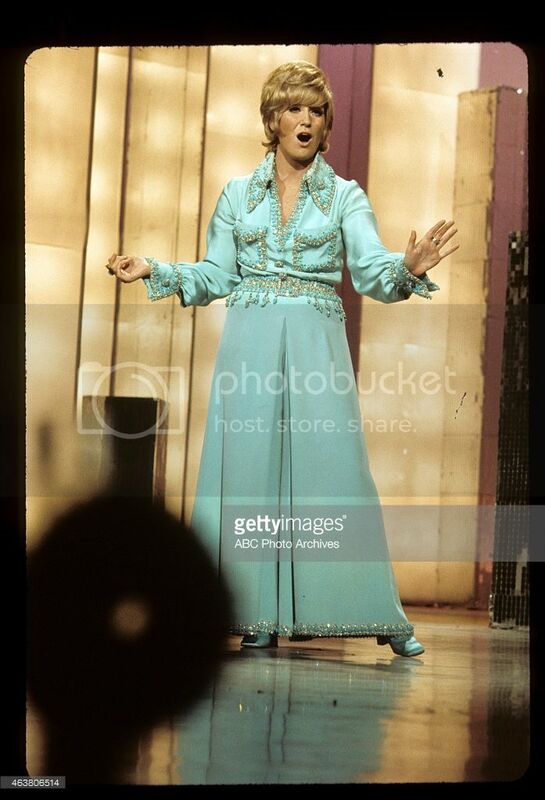 Good even' to you fellow Dusty fanatic brothers and sisters of the world! Hope your all well, came across this photo that I believe was posted earlier today on the 'official' Facebook page and then dissapeared for some reason (I cant see it anymore) so thought I;d share it anyway, especially for anyone who didnt see it or doesnt use Facebook, what a great photo eh? What do we think? 1972 or 1973? Neil-that is a lovely photo. It's a "never-seen before" photo for me. I just love those. I am not on facebook, so I would not have seen it. Thanks a bunch from a Dusty fanatic! Thanks for posting Neil. Photo new to me also! Dusty always looked great no matter when the photo was taken! 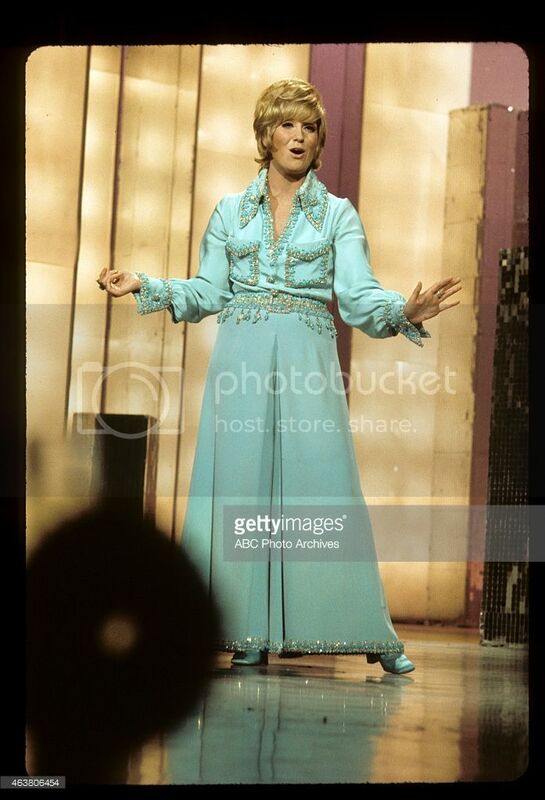 Grammy speech always makes me laugh........................and the United Nations! Thanks for posting Neil & Frans. What a pic and memory to own, that is. Yes saw it for the first time on Fb, great fan pic and was new to me. New to me with the doggie. This one too, its similar to others we saw a little while back. Lovely Cas , new ones , like the dog , and the hand gesture ..
What great photos Cas. Looks terrific, and the jewelry!!!! Thanks Cas....those are great. 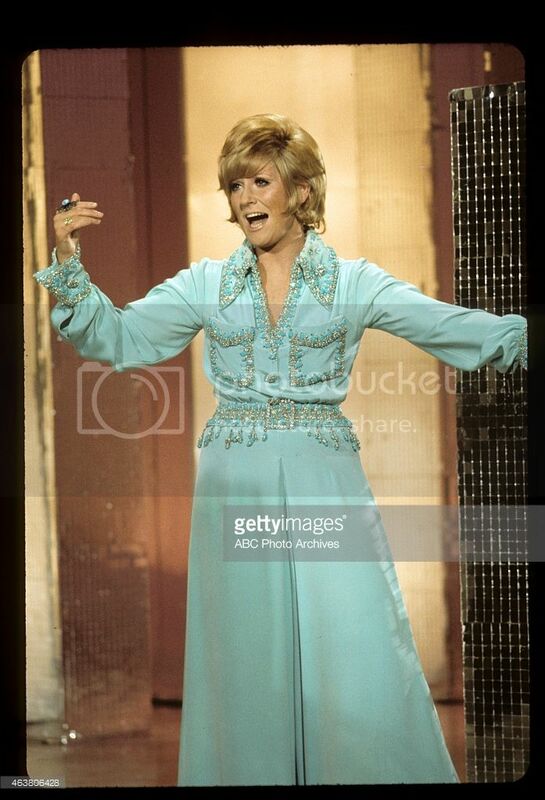 Dusty looks wonderful - very 'star' like. Wonder where they were taken, and who the gorgeous dog belongs to? Weren't these taken in the Amsterdam Apartment before she had moved back to London. 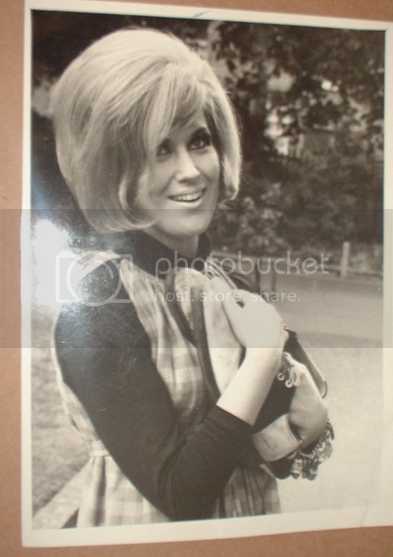 Dusty on a night out in late 1963 or early 1964, judging by the hairstyle. But who is in the framed picture next to her? And the guy behind her? I think the picture/poster is of Tommy Steele. Sorry don't know the fella. 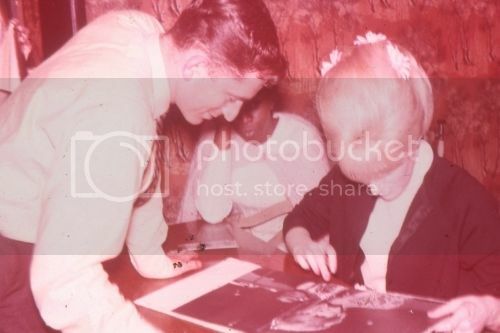 The man with Dusty is her then manager and friend Vic Billings. The photo was used often in the early sixties. And yes, it is Tommy Steele in the frame. Thanks Carole for the info. Thought it looked like Tommy Steele!!! Loved the new to me ,pick with the dog . she is always so relaxed when the animals are in the frame. Thanks Carole. I should have recognized Tommy Steele, but I couldn't see him clearly. I was sort of hoping she was at a drag show . This one turned up today so I think it deserves to be on this thread too. Love that pic Cas. She does look like a little doll!!! 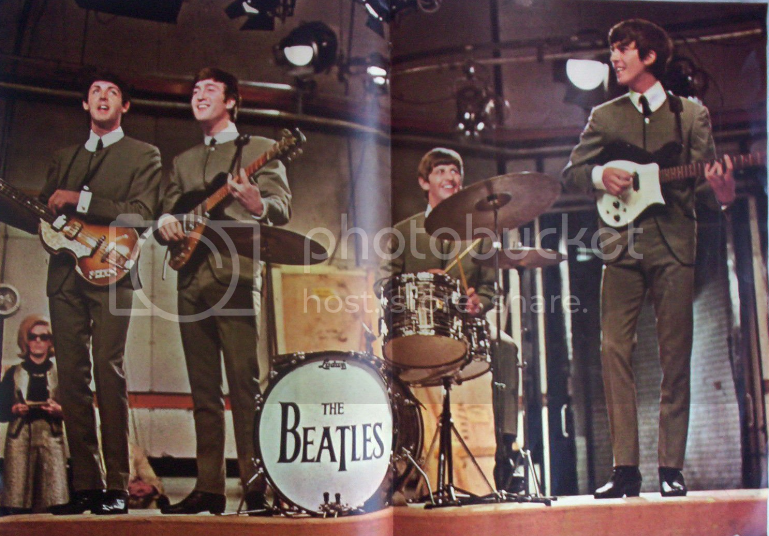 I hadn't seen this in colour before, centre fold of a magazine. Good to see this in colour. We get so used to black and white from the 60's. Yes like the colour, we spent long enough in that black and white world. A great couple of photos of Dusty at Mascot Airport in Sydney in September 1967 with manager Vic Billings, neither of which I'd seen before. Thanks to Edward for sending the photos to me. There are another couple of Dusty on her own that I'll add later. Good to see these of Dusty and Vic. What great pics Carole. Nice to keep seeing old ones !!! Thanks for posting , always nice to see others . Thanks for posting them on this thread too Carole, they deserve to be here, great pics. Great find Carole & Ed. The two other lovely photos from the same time (Sept 67) that were sent to me by Edward. Thank you Carole great new pics. Thanks to Edward too. Thanks for posting Carole , and thanks to Edward for these ..nice of him and as we always say lovely to see new ones .. This one was new to me. Lovely pic isn't it? It certainly is and not even just another pose from an already known shoot, completely different! I wonder where, when and why? I mean why is she holding a pair of what look like men's shoes? Lovely, thanks Cas. That's terrific Cas. Yes. What's with the slippers I wonder???? Thanks for posting Cas , another lovely one , wonder what the story behind this is ? I've no idea, its for sale on Ebay. On the back it has 1968 and other dates. Its bidding at £43 last time I looked. Theres a couple more pics but they are not new, least not to me. Lovely photograph,she looks so young happy and beautiful. I saw those dates on the back as well, they don't mean much, we've been fooled before! 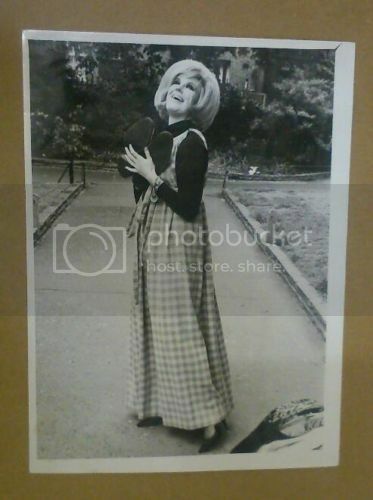 It's '64, I'd guess NY but I'm only going by the American looking shoes she's holding, though the photographer is called Ian Yeomans and the only one I can see with a quick Google search appears to be a Brit. Don't they look a bit like the shoes they make you wear when you go bowling? Yes I agree dates mean nothing at all. Shoes do look like bowling shoes Donella , that came to my mind too. The shoes look like saddle shoes to me. Sometimes worn with poodle skirts. Don't know why Dusty would be holding them. This one has turned up on Ebay too, Carole G spotted the pic in the Bulletin also. Dusty certainly had affection for the shoes . Yes I thought it was one I hadn't seen before Maggie I put it on fb a couple of days ago, but someone put an article on and the pic was used. I still think I hadn't seen the full pic before. This one too, and theres two more I don't have time to load at the moment. Thanks Cas looking forward to the others too ..
Great pics Cas. 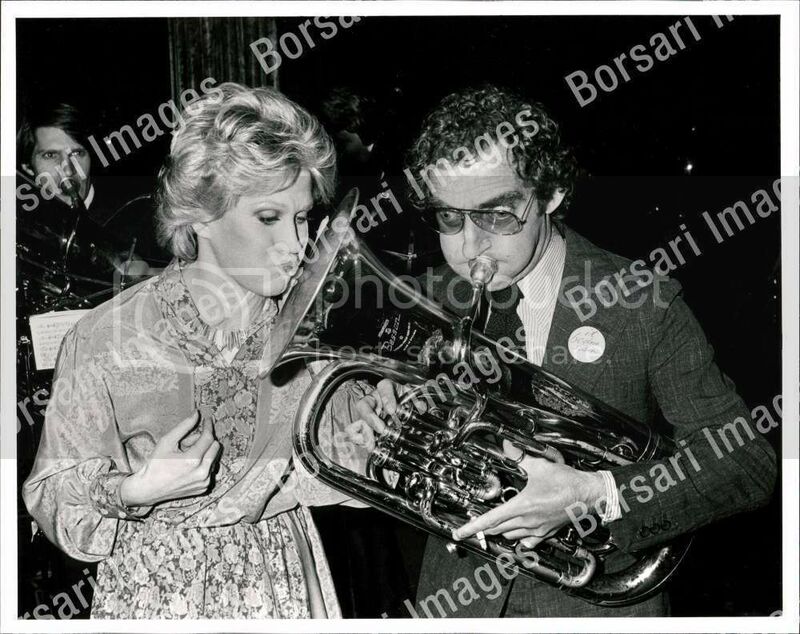 Is that Monty Feldman playing the Euphonium ? 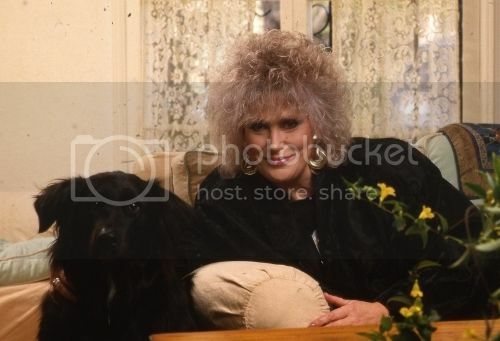 Some Old photos of Dusty and sometimes me!! 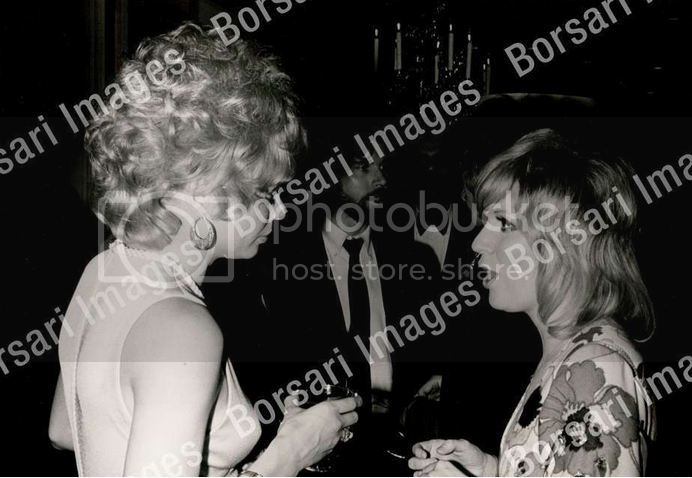 Taken at "Talk of the Town"
Love the photo of Dusty chatting with Juliet. New to me. DustyMIke...your hair is the same color as Dusty's in all your pics. Lucky you!